This conveyor gently handles your most delicate products. 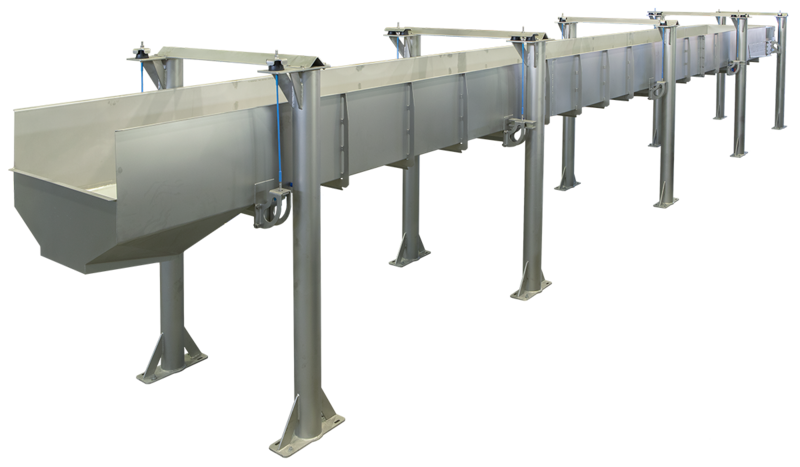 With the possibility to have long pan lengths, up to 30 meters, combined with different gate and lane configurations gives a cost effective option compared to a modular distribution system. The possibility to reverse product direction and the ability to place the drive at either end or even below the conveyor make the conveyor suitable for most layouts. Its self-cleaning pan and its ability to replace several conveyors, reducing transfer points, are two important factors when considering a new conveyor for your product. The VibRHM is superb as in-line-storage with capacities up to 5 m³ of snack. If desired we can also supply bucket elevators in various sizes and configurations including with multiple discharge points. Contact us for more detailed information.